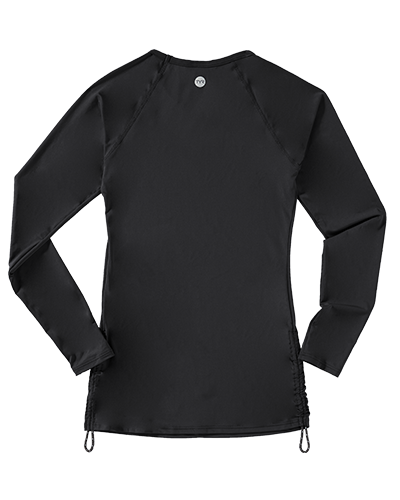 Designed for a dynamic lifestyle, the TYR Women's Belize Long Sleeve Rashguard - Solid caters to adventurists both in and out of the water. Whether it's a morning workout or a paddleboarding excursion, the fitted SWFNL7A features the ultimate blend of comfort and function. Full length sleeves with thumbholes provide extended arm coverage as you move, while UPF 50+ technology ensures sun safety during outdoor activity. A: Thank you for contacting TYR Sport. Our Women's Solid Long Sleeve Swim Shirt is created with UPF 50+ technology, which ensures sun safety for every outdoor activity. Durafast Lite fabric with a sleek fit for unrestricted movement. Q: What do you wear under a swim shirt? Does the swim shirt come with it's own support? A: Thank you for contacting TYR Sport! We are always eager to answer any questions you have about our products. 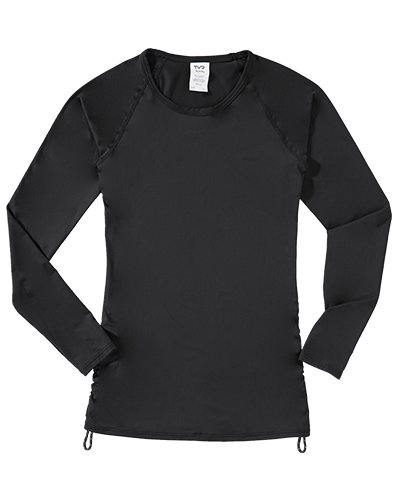 The Women’s Solid Long Sleeve Swim Shirt is designed for sun safety for every outdoor activity. The Swim Shirt can be work over a bikini, swimsuit or sports top. Q: If I place an order, when can I receive? A: Thank you for your inquiry. Our shipping facility is located in California. Depending on your location transit time can take anywhere from 2-5 business days. Q: How true to size is this shirt with the size chart.. I am right in between sizes and if the shirt is a little tight I want the bigger size, but I don't want the shirt baggy. The shirt is meant to be fitted, sizing up will give you a little more length. It is not the type of shirt that will fit loose. Q: Can you find me the black in size small? Your out on this site. Designed for a dynamic lifestyle, the Women's Solid Long Sleeve Swim Shirt caters to adventurists both in and out of the water. Full length sleeves provide extended coverage, while adjustable cords at each side seam can be modified for a custom feel.